Nye County Democratic delegate Robert Hanson enjoyed caucusing in February but still thought Nevada needs to go back to a primary. At the Nye County Democratic Convention on Saturday, Hanson, a delegate for Bernie Sanders, brought forward the idea to get rid of the caucus, which he called “exclusionary.” The proposal received support from some delegates, while others spoke against it, pointing to the status that the caucus gave Nevada in general elections. Hanson, who had voted in primaries before, said the caucus wasn’t “fair to everyone,” because people can only vote during certain hours, as opposed to the primary that has a broader voting window. “It’s unfair to people that have to work and can’t attend,” Hanson said about the caucus. In an impromptu vote, 68 Nye County delegates said Nevada should go back to the primary and 51 delegates said it should stick with the caucus. 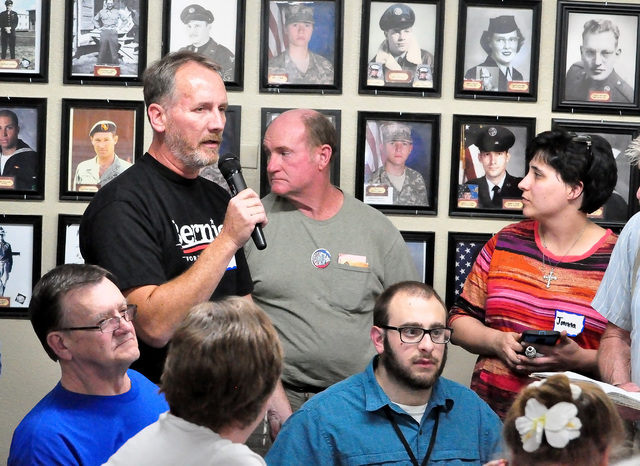 Along with other ideas on the Nye County Democratic Party platform, the suggestion will head to the Nevada Democratic Convention in May, but Nye County Democratic Central Committee Chair Cliff Arnold said it may take months to move forward. “That takes time. Those things will be done over time, so it’s all done legally, and we can throw in more,” he said. Other issues on the Nye County Democratic Party platform included strengthening Medicare and Social Security, continuing the Affordable Care Act, raising taxes on the wealthy, increasing the minimum wage in Nevada to $15 and keeping loan guarantees for renewable energy projects. The Nevada caucus was the third step in the 2016 presidential election after the Iowa caucus and New Hampshire primary. Nevada became an early battleground state in 2008 at the urging of Nevada Sen. Harry Reid. The Nevada caucus has grown to prominence in recent years and has drawn national attention during Democratic and Republican caucuses on Feb. 20 and 23. This year, 84,000 Nevadans participated in the Democratic caucus, many of them for the first time. Some argued that abolishing the caucus could be more difficult on a county level. “We, as county, have zero control over what the state does in terms of how we handle caucus versus primary,” said Joanna Lien, first vice chair of the Nye County Democratic Central Committee. The caucus propelled Nevada to national politics and gave it better voice, others said. Bob Gang, another delegate who attended the county convention said he was against abolishing the caucus. He said it gives Nevada “more voice” in the general election. “By June, it’s over. I’ve voted in elections where the candidate was already decided. In February, at least in Nevada, our voice is heard, I feel,” he said. Arnold said he was also initially against caucusing, but later was able to see its advantages. “I think we should stay with the caucus, I think it proved out today, it proved out. … Nevada would not be the first in the West, our opinion wouldn’t have mattered anywhere, people would have said, ‘where’s Nevada?’ and you wouldn’t have a big show-off, it wouldn’t happen,” he said. Ken Washington, who had lived in Pennsylvania and California but moved to Pahrump 3 years ago, caucused for Clinton for the first time this year. Washington said he understands the caucus, but still likes the primary better as he is more accustomed to the process.